I was feeling very positive as I stepped off the plane on West Island in the Cocos (Keeling) Atoll. It was Friday 30 November. I had seen three lifers in the previous three days in Western Australia, and now Cocos promised more. I had hopes that the Barau's Petrel would return. It had been seen the previous two years frequenting the runway. And I'd heard that there was a Grey-streaked Flycatcher which could be seen easily on Home Island. There were 14 of us doing Richard Baxter's tour of Cocos and Christmas Islands, some people I'd met before, some I hadn't. I was ready to enjoy some great birding with them all. Where we looked for the Grey-streaked Flycatcher on Home Island. My first disappointment was to learn that the Barau's Petrel had not returned. It was still possible it might turn up, but it now seemed unlikely. I put my hopes on the flycatcher. On Saturday, those of us who hadn't seen a Saunders's Tern, were taken to South Island. The rest of us took the ferry to Home Island. As soon as we stepped off the jetty, James saw a small passerine fly up from the ground, then into a shed. We stalked it, saw it well, then it flew to a nearby tower. 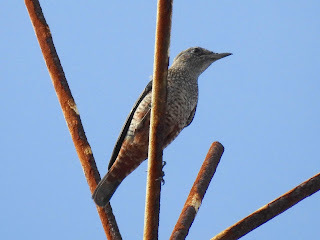 It was a Blue Rock Thrush (# 817). It seemed a little unfair to me that I should get this bird so easily. A Blue Rock Thrush had turned up at Onslow in WA not long before and I had not twitched it. I didn't deserve to see it so easily. But who am I to complain? A tick's a tick. We spent Sunday on West Island looking for a mysterious raptor that had been seen with two White Terns in its talons, and a Hodgson's Hawk Cuckoo that was around. We didn't see either. On Monday, we again took the ferry to Home Island, where I would be staying for two nights in Oceania House with James and Rob. Locally known as the Big House, Oceania House was built in the nineteenth century by John Clunies-Ross. It is a fascinating old building. I'd stayed there on my last visit and welcomed the opportunity to stay there once more. Again, we looked for the flycatcher. It had been so cooperative a few days beforehand, and now, despite many hours of patient searching, it had not shown itself. We could only conclude that it had moved on. That was my second disappointment. A group of us was standing in the garden of the Big House, when a strange bird flew past. Thanks to Rob Shore's lightning fast photography, it was identified as a Chestnut-winged Cuckoo (# 818). That was a remarkable five lifers in seven days. 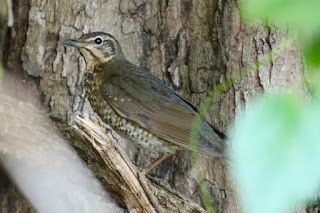 On Tuesday morning, before the others arrived back on the early ferry, we were very pleased to see the Siberian Thrush again. We left it alone, in the hope that it would show itself to the others when they arrived. 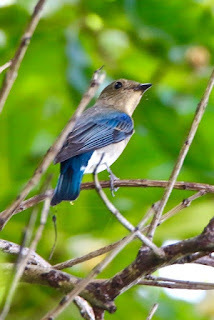 Again, we searched at the flycatcher site, but we no longer expected to see the flycatcher. When the others arrived, a few of us went for a walk with Richard, past chook sheds and various caged birds, ending up back at the small park near the jetty. There, Richard spied a Blue-and-white Flycatcher. I was delighted to see this bird. I'd seen one before, but it was a brown bird, and this fellow was a first year male, with gorgeous blue wings. On Wednesday, most of the group waded through the sea to South Island, in search of a Chinese Pond Heron. I stayed in the garden, hoping for a rarity that didn't arrive. I returned to West Island on the 10.30 ferry. 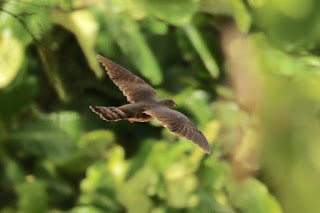 On Thursday, while some people chose to go to Direction Island or back to Home Island, I stayed on West Island and saw the Hodgson's Hawk Cuckoo. Again, this wasn't a lifer for me, but it's always good to see uncommon birds more than once. On Friday, we left for Christmas Island. I'd seen 31 species on Cocos (naturally, others saw many more than I did). I was very pleased with myself, wondering if I would ever again see six new species in seven days. Sue Taylor. Simple theme. Powered by Blogger.